Three Greek cities are in the top 100 city destinations ranking in terms of international tourist arrivals, according to market research company Euromonitor International. 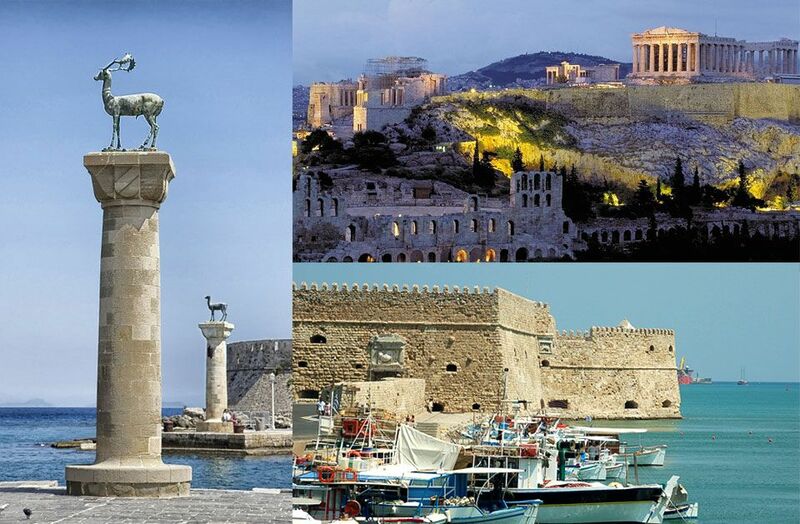 Athens, Heraklion on Crete, and Rhodes have made it into Euromonitor’s annual Top City Destinations Ranking in the 47th, 74th and 100th ranks respectively in terms of year-on-year (y-o-y) growth for the 2014-2105 period. 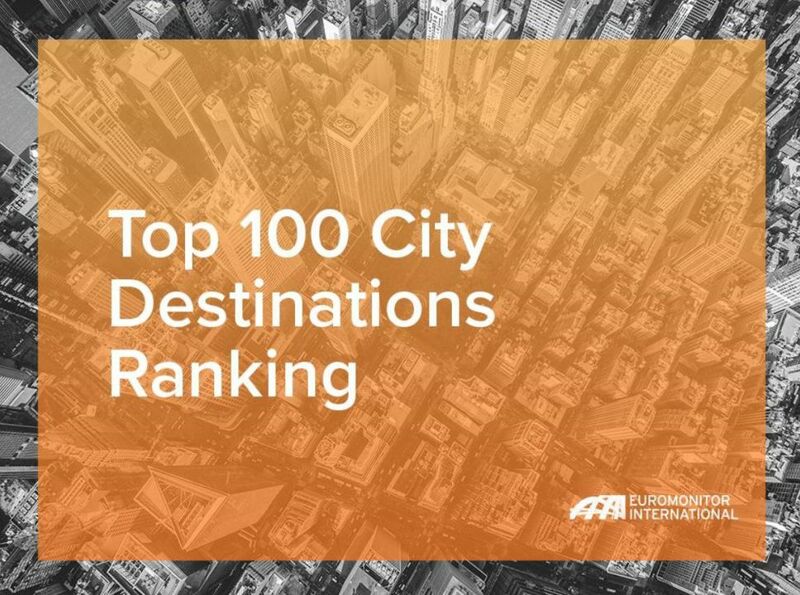 The top cities in the report outperformed global travel flows with inbound city arrivals to the top 100 cities growing by 5.5 percent between 2014 and 2015. The Greek capital saw an increase of arrivals with 3.39 million in 2014 and 4.2 million in 2015, coming in first among the top five strongest performers in Europe for inbound arrivals in 2014-2015. On the downside, Athens also holds 6th spot in the TomTom’s 10 Most Congested Developed Cities in 2015 ranking. Despite political and economic turmoil, however, Athens marked another record year with arrivals growing by 22.6 percent in 2015. The city of Heraklion was ranked among the top five weakest in Europe for inbound arrivals in 2014-2015. The Cretan city saw 2.6 million arrivals in 2014 and down to 2.5 million in 2015, a drop in growth by 1.8 percent y-o-y. Last on the list, Rhodes made it into the 100th spot, with 1.926 million arrivals in 2014 and 1.902 in 2015 marking a decline of 1.3 percent in y-o-y growth. The Euromonitor report underlines that both Heraklion and Rhodes have been impacted by the continuing refugee crisis in the Aegean. 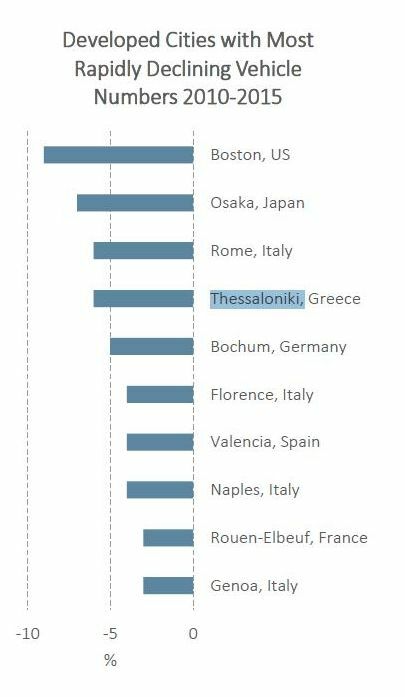 The northern port city of Thessaloniki, meanwhile, did not make it into the top 100 list but did get a good mention as being among the top 10 European cities ranked 4th with the most rapidly declining vehicle usage. It appears that city-dwellers there are opting to leave their cars behind and instead use public transportation or alternative means. 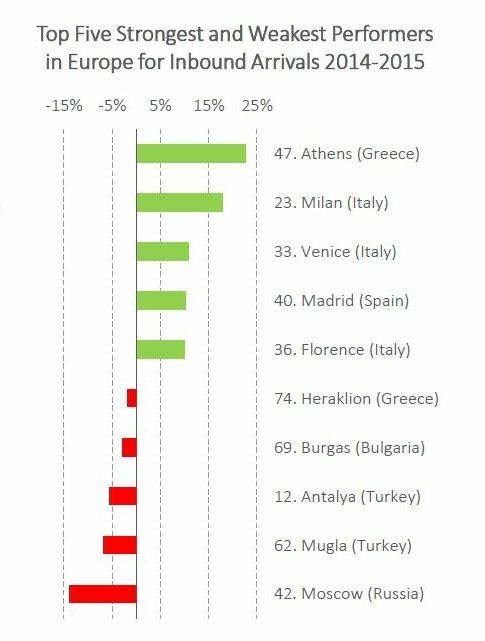 According to Euromonitor’s findings, Greece was among the winners in 2014-2015, attracting increasing number of visitors due to the terrorist attacks at neighboring destinations. Portugal, Spain and Italy also saw arrivals boom. The top five cities on the Euromonitor ranking were: Hong Kong at number 1 for the seventh year running with 26.7 million international visitors in 2015, followed by Bangkok, London, Singapore and Paris. The ranking also found that Japanese cities saw impressive growth, with Tokyo rising eight places to rank 17th, and Osaka and Kyoto entering the top 100, ranking 55 and 89 respectively. Tunisia fell due to multiple terrorist attacks, with Mecca in Saudi Arabia being the best performer in the region due to a strong growth in the number of religious tourists. Mexican tourism is on a rise with Cancun still a top choice. Lima also performed well marking 9 percent growth in 2015. “[The year] 2015 was another turbulent year. Terrorist attacks, geopolitical conflicts, economic uncertainty and health scares like MERS and Zika were just some of the factors impacting city arrivals. Nevertheless, top cities outperformed global travel flows, registering growth of 5.5 percent in international arrivals compared to 2014, showing the resilience of global cities as travel destinations,” said Euromonitor International’s Travel Analyst, Wouter Geerts. Euromonitor International’s Top City Destinations Ranking (2015 edition) was carried out by a global travel research team in 58 core countries by in-country analysts.